Jeff and I grew up in Alabama and spent many summer vacations in Panama City Beach and remembered the awesome beaches. We both dreamed of owning our own beach place someday. Well, it took a while but here we are!!!!! Hope you will enjoy the beach and all that Tropic Winds has to offer as much as we do. Barbara & Jeff purchased this condo in 2013. This condo offers incredible views and sunsets second to none. This low density building gives you the feeling that you have the beach and building all to yourself. No fighting crowds as found in other resorts. This is truly a one of a kind luxury unit. 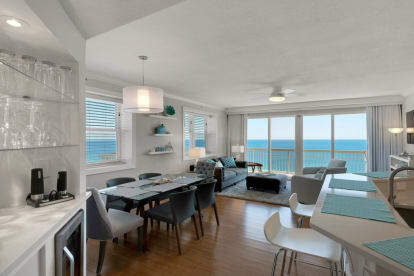 Rent between March 1st and October 31st and receive a free beach setup during your stay. A free setup includes two beach chairs and an umbrella. Our daughter, Jessica, manages our rentals. We love the beautiful powdery white sand and emerald waters of Panama City Beach.